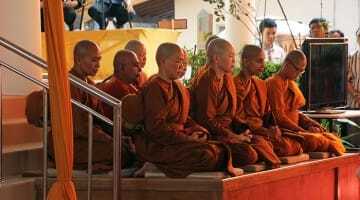 Thai bhikkhunis — fully ordained female monastics — are being called “rebels” as they challenge the religious status quo in Thailand with their demands for more gender equality and the full ordination of women, according to the Associated Press. The tradition of ordained nuns or female monks – bhikkhunis in Pali or bhikkshuni in Sanskrit – goes back to the Buddha. However, because the practice lapsed, died out, or was never introduced in some countries, even Buddhist leaders who are supportive of women’s full ordination such as the 17th Karmapa have been struggling with how to reintroduce it. This story comes at a time when the movement to grant full ordination to Buddhist nuns is gaining momentum in Thailand and elsewhere. Lion’s Roar has been following these developments closely. As AP reported, in Thailand the Buddhist “female monks” or bhikkunis are being hailed as a force for reform at a time when the country’s male-dominated religion has been hit by a wave of scandals. Monks have been accused of committing crimes such as murder, money laundering, and other gross violations of their vows. Full ordination of Buddhist women is still banned in Thailand so women have been forced to seek ordination elsewhere, such as in Sri Lanka. AP reports that Thailand’s Supreme Sangha Council, holding conservative views, has urged the Thai government to ban visits by Sri Lankan clergy after a so-called “rebel ordination” of eight bhikkhunis by Sri Lankans in Thailand last November. This wasn’t the first time that the Thai religious authorities have tried to crack down on female ordination. In 2009 Lion’s Roar reported that two monks from the Thai forest tradition, Ajahn Brahm and Bhikkhu Sujato, took part in the ordination in Australia of four bhikkhunis. That act challenged the core of Thai monastic authority and led to the official expulsion of Ajahn Brahm. Currently there are about 100 bhikkhunis in Thailand who obtained their ordination in Sri Lanka, says AP. This latest news report suggests that times are changing in Thailand and that the bhikkhunis are enjoying increasing support from the general public. Read more of our coverage of the growing movement for women’s ordination and our reports from countries such as Indonesia, Thailand, Tibet, and Korea.